Chick 101-Football for Girls: Jim Harbaugh new coach of SF 49ers! Here he is, folks! 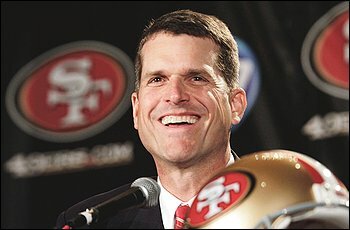 The brand new head coach of the San Francisco 49ers, Jim Harbaugh. He accepted the 5 year, $25 million offer yesterday after a successful 4 years as Stanford's head coach. He was also courted by the Dolphins (while they still have a head coach, Tony Sparano. Um.....awkward!) but decided to stay here in Northern California. After doing a little research, however, I found the REAL reason he's staying....apparently Harbaugh has a two year old and a newborn at home. Can you imagine that convo between him and his wife?? --"Honey, the Dolphins might pay me 8 mil a year to be their head coach!!!" --"The Dolphins....as in Miami? Miami....as in 3000 miles away?" --"I don't care how many millions they offer you, you are NOT making me move all the way to Miami with two kids under two!" --"Well, there IS this deal with the 49ers 10 miles away...."
In all seriousness, we welcome Jim and welcome his ideas on turning this team around! People are also really excited because 32 years ago, Bill Walsh was hired away from Stanford to coach the 49ers. Bill Walsh is a SUPER important guy. FOR SURE drop this knowledge on your dude. Walsh popularized what is known as the "West Coast offense,"which basically means the team relies on a series of shorter pass plays (throwing the ball sometimes horizontally to receivers) instead of relying on their "running game" (when the guy tries to run with the ball through that line of mack trucks in front of them) as you see so often at the beginning of the game. Say something like, "I know you can't compare Harbaugh to Walsh just yet, but do you think he'll get the Niners out of this mess? Think he has what it takes?"